There are kids who are quite fascinated with science. Doing experiments is their idea of having fun. And when kids learn that they can do experiments with everyday things at home, it make them even more excited to discover more of what they can do. 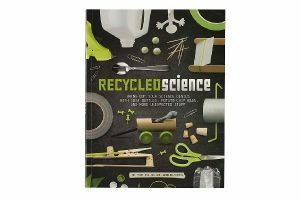 With this Recycled Science book, kids will learn how to conduct experiments with things they can find at their home recycling bin. Recycled Science is a book that contains a number of science experiments using recycled materials. Kids can make an ice cream maker out of a discarded chips tube. While doing that, they can also learn how salt makes ice freeze faster. Kids can also learn how to create their own mini compost out of old food scraps. They can also transform a regular water bottle into a lava lamp and understand why oil and water molecules do not mix. The Recycled Science book comes in an easy-to-read format with full-color photographs. Each experiment also features easy step-by-step instructions as well as list all the materials needed for each project. The book encourages kids to develop their logic, problem solving and critical thinking skills. It also helps them to further increase their interest in science. The Recycled Science Book is ideal for kids from 7 years old and above. It is available at Fat Brain Toys for around $10.